A Cornell-educated anthropologist, Allison Lakin found her way to cheesemaking on a circuitous path that included working as a maritime museum food historian and indulging in regional cuisine during a four-month cross-country road trip. 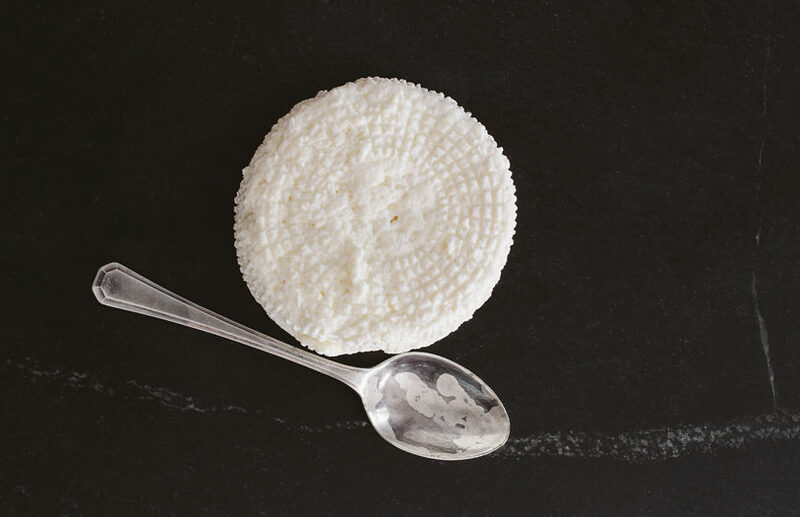 Her Lakin’s Gorges Basket-Molded Ricotta is silky and slightly firm with the sweetness of fresh, whole milk. It’s yummy smeared on crackers, pan-fried like paneer, and tossed into scrambled eggs just before serving. Lakin especially likes to combine it with Morgan, her “answer to Parmesan,” when she makes sformati, Italian custards similar to mini-soufflés. Makes 9–12 sformati. Lakin’s Gorges Cheese, Waldoboro. 207-230-4318. Butter 12 ramekins or muffin cups and dust with breadcrumbs. Cook asparagus (or ferns) in boiling water for about three minutes or until tender. Drain liquid, reserving 1 cup. Coarsely chop ferns or stalks. Reserve some small, intact ferns or asparagus tips for the tops of the soufflés. Sauté onions in butter until tender. Purée onions and ferns or asparagus. In a large bowl, combine puréed vegetables with ricotta, Morgan, and flour. Season with salt and pepper to taste. If mixture isn’t smooth, incorporate reserved cooking liquid a tablespoon at a time until it is. In another bowl, whisk eggs thoroughly. Stir in the ricotta-fern mixture. Fill each ramekin or muffin cup with ½ cup of mixture. Top with the reserved fern or asparagus tips. Bake in a 350-degree oven until set and lightly browned and the tip of a knife comes out clean when inserted, about 25 minutes. Note: If you have a food processor, simply add ingredients in order one at a time and process after each addition, no reserved cooking liquid required. A selection of Maine’s best cheeses, with tasting notes!